When donors are trying to figure out where to give, career services comes out on top. The Center for Career Services has received more than $7 million in large donations over the past two years, including some of the largest publicly announced donations GW has received since 2014. And at a time when GW is increasingly trying to market itself as an institution that prepares students for the real world, the donations also fit into its long-term goals. Experts and officials also say donors give to areas where they can see a real impact – and career services gifts could help ensure students graduate with jobs. Since billionaire philanthropists Sumner Redstone and Michael Milken gave a combined $80 million to rename the public health school in 2014, GW has publicly announced three gifts worth $1 million or more. All but one of those gifts have gone to the career services office. 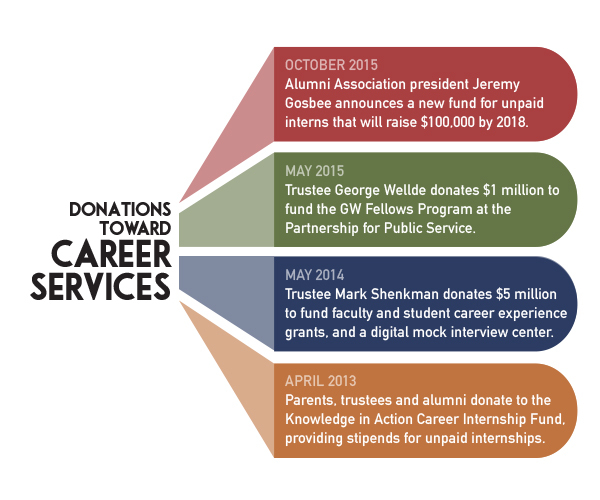 The center’s popularity with donors spiked in May 2014, when trustee Mark Shenkman gave $5 million to GW’s career services office and the School of Business’s career office. This May, trustee George Wellde donated $1 million for a young alumni fellowship. Aristide Collins, the vice president for development and alumni relations, said alumni, parents and trustees have shown an interest in donating to students’ career development opportunities because they see the value of adding onto the University’s resources in that area. “We continue to engage with many groups to discuss ways in which their gifts can support GW students’ career development goals and opportunities,” Collins said. Earlier this month, the Alumni Association announced it would start a new fund to support students taking unpaid internships, and hopes to raise $100,000 by 2018. The School of Media and Public Affairs also started an unpaid internship fund last month, and though those two funds aren’t directly funneled into career services, they support the same career preparedness that officials and experts say donors care about. Other donors, including trustees W. Scott Amey and Steve Ross, as well as parents and alumni, have funded career internship funds since 2013, allowing students to pursue unpaid internships for experiences they could not otherwise afford by offering them a stipend of up to $3,000. The Office of Career Services has undergone a major overhaul over the past three years as part of the University-wide strategic plan’s call for improved career resources, bringing in field-specific career coaches and inviting employers to come meet with students. Students met with staff from media companies like Politico and Bloomberg BNA at the career fair last week, part of the Office of Career Services’s efforts to bring more employers to campus to meet with students. Collins said officials haven’t been specifically focusing on the career center in their conversations with donors. Rather, officials will highlight areas for donors that fit a need GW has and line up with what the donor cares about. “We have a donor-centered approach, and as with any area at the University, we work to align donors’ interests with our students’ needs to foster a mutually beneficial relationship,” Collins said. 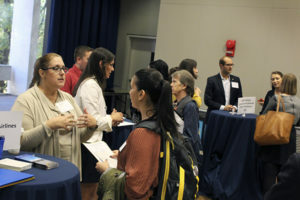 Rachel Brown, the assistant provost for University Career Services, said donations have allowed the center to establish scholarship and grant funds and create chances for students to travel outside of D.C. to meet potential employers. She said Google, Facebook and Amazon are some of the companies the Center for Career Services has recently made connections with for students’ career development, which would not have been possible without donations. Google representatives visited campus twice last week. Shenkman’s gift in May 2014 is the largest-ever gift from a sitting trustee. The gift created faculty and staff innovation grants, which allow faculty to bring career development opportunities into the classroom through individual grants up to $2,000. The gift is also funding a digital mock interview center and helping Operation GW VALOR as student veterans translate their skills into careers. Dara Baker, a senior majoring in biology, did research in Israel this summer after receiving money through an unpaid internship grant to pay for her flight and living expenses. “I would have had to pay out of pocket for housing and a plane ticket to get to my internship, so it’s a toss-up as to whether it would have happened,” she said. Baker attended an event in September to thank current career services donors. Officials frequently ask students to thank their scholarship donors. At Flag Day last spring, students were able to write thank-you notes to donors as a sign of their appreciation.